PORT-LOUIS, Jan 21 2012 (IPS) - Amateurism, high prices, mismanagement, and a limited product range have discouraged Inderjeet Rajcoomarsingh, the former chairman of the Mauritius Agricultural Cooperative Federation, from shopping at cooperative stores. Instead you can find Rajcoomarsingh, who was a cooperative member for 34 years, pushing a trolley full of goods at The Bagatelle, a new shopping mall that is presently the craze in Mauritius. Many Mauritians, mostly the youth here, say they have never heard of cooperative stores or the principles of consumer cooperatives. In theory consumers’ cooperative are meant to provide quality goods and services at the lowest price. But in practice, their goods and services are priced at market rates or higher. “Today, a cooperative is just a name. There is no value and no principle. I don’t see that people’s lifestyles have improved so much in Mauritius by shopping at cooperative stores,” Rajcoomarsingh told IPS. Cooperative stores did well here until the 1990s when the robust economic development of the island paved the way for supermarkets and, later, hypermarkets. Now, shopping malls have sprung up all over the island like mushrooms after the rains. Several new shopping malls are set to open this year, putting another nail in the coffin of cooperative stores in this International Year of Cooperatives. IPS visited the Advance Coop Society, at Plaine des Papayes in northern Mauritius. Here the store was disorganised, products were not properly displayed and the prices of goods were higher than that of the same goods on sale in local malls. And there is no such thing as a business returns policy or even customer care. It is probably why Abdel Khodabockus, a teacher who lives near a cooperative store, has not entered one in years. “It is long time back since I have entered a cooperative store,” Khodabockus said. And 21-year-old Mariam, who does not want to be identified, has never stepped foot in one. “Since my childhood, my parents took me to supermarkets for shopping and I have got used to it. It’s modern and clean…and we get all the products we need under a single roof. I don’t care for a cooperative shop because I do not know what it is all about,” she told IPS. This does not surprise Dawood Mootoojakhan, who was once a member of a now defunct cooperative store at Plaine-Verte in the country’s capital. “There is not a single good cooperative store in Mauritius. People who think the opposite are lying. I have personally witnessed cash and goods shortages in our cooperative shop, but who cares? That’s how our cooperative store went bankrupt some years back,” he told IPS. That and a lack of progress from cooperative stores is one of the reasons for their failure. “Cooperative stores remained stagnant when the island was developing fast. They did not modernise and develop further their operations to satisfy the demands of the population whose income and lifestyles were improving under the economic miracle of the 90s. The arrival of supermarkets accelerated this decline,” said Suttyhudeo Tengur, secretary of the Camp Thorel Multi-Purpose Cooperative Society Ltd, which owns a cooperative shop at Camp Thorel, a village in eastern Mauritius. He added that the Camp Thorel cooperative is doing well. In just one decade, from 1990 to 2000, the number of cooperative stores fell from 95 to 30. Today, only three are operational. 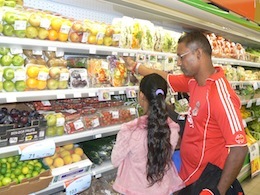 Tengur blamed the Mauritius Consumer Cooperative Federation (MCCF) for the downfall of cooperative stores. “This organisation was supposed to set up a central warehouse and import large volumes of goods to sell to the stores at better prices. It abandoned this activity long ago, preferring to buy from the private sector and sell to the consumers. Because the MCCF has failed in its mission, many cooperative stores have closed down,” he said. Yogendrasing Sreepaul, MCCF chief executive officer, agreed that the consumer cooperative sector has failed in Mauritius but he denied that it was because of his organisation. “Co-operators who manage these stores are uneducated, they have no vision and will to modernise their shops and keep pace with development. They themselves have pushed consumers into the arms of super- and hypermarkets and shopping malls,” he said. Sreepaul said cooperative stores are no competition for private business, as they do not have competent and visionary people. “They do not have such qualities. Most importantly, how do you compete with a business in which millions of rupees have been invested with your 10-rupee share in a cooperative store?” he asked. Other challenges that cooperatives in Mauritius face, according to a member of the Mauritius Cooperative Union, include a lack of capital, archaic management, no strategic planning, poor leadership, and low productivity, among others. The MCCF is trying to save some of the cooperative stores by taking over their management and converting them into Fair Price Shops and trying to compete with the supermarkets. Seven such shops have been opened in 2011. Here goods are sold at reasonable prices. “Shopping malls are selling at 35 to 40 percent mark ups. Why can’t our stores import their own goods and sell at 20 to 25 percent mark up? This can be done,” Tengur said. Both Tengur and Sreepaul blame the Ministry of Cooperatives for having let down consumer cooperatives. Both said public officials have not done their jobs of inspection and supervision properly. Minister of Cooperatives Jim Seetaram disagreed. “I do not find any cooperative society closing down in my books. Instead, our audit shows they are performing well,” he told IPS. He said consumer cooperative stores suffer from a lack of visibility. “Many people are not aware of them. The youth should be encouraged to get involved into the movement,” he said. However, Seetaram said that while consumer cooperatives were not successful, the cooperative movement was doing well in other sectors in Mauritius. He said 40 percent of sugar and as much as 70 percent of fresh produce produced in the country was from cooperative societies. The cooperative movement contributes to about two percent of the country’s GDP.